If you have a lawn that covers more than ½-acre or 43,560 square feet in area, save yourself time and effort with a riding lawn mower. When we say riding mower, we include both lawn tractors and zero-turn mowers. Riding mowers are often capable of much more than just mowing the grass. Many models are able to pull trailers, spreaders, plows, aerators, and push scoops and shovels. This makes them useful all year round. Since this type of machinery is a big investment, we’re going to cover how to select the best model for your needs. Then we’ll review the top models on the market so you can choose the one you want. The first consideration for choosing a riding lawn mower is size. No matter how big of a lawn you have to cut, certain factors will limit your choice. Generally speaking, if you want to efficiently cut an acre of grass, you’ll want at least a cutting deck of 36 to 42 inches in diameter. As your amount of area to cut increases, so will your desired deck size. But area isn’t the only thing to consider. You’ll want to measure the width of spaces where you want to pass with the mower, like between gate posts, the doorway of the shed or garage where you plan to store it, and between obstacles like trees or yard decorations. A big mower is only helpful if it can reach the areas you want to cut. If you don’t have much storage space, or if your lawn has a lot of obstacles, you may want to settle for a smaller mower you can actually use instead of pulling out a push mower to cover the tight spots. Rear Engine mowers are one of the most common types you may have seen people using in residential areas. They are usually less expensive than the other two types we’ll discuss. Typically, their engines are between 190 and 500cc and their top speed is about 5mph. Their cutting decks measure between 26 and 33 inches in width. This narrow width is convenient for storing in a shed or garage. Rear Engine mowers don’t come with the best assortment of attachments like spreaders and shovels. That feature is reserved for lawn tractors. Lawn tractors sport an engine in the front, and it’s usually between 400 and 800cc. They can move faster, up to about 8mph. The average cutting deck width ranges between 38 and 54 inches. Lawn tractors can haul and push a wide assortment of attachments like aerators, spreaders, and scoops. But since they are larger, they require more space to operate and store. Zero Turn Mowers are able to turn 360 degrees on a dime. They are highly maneuverable, with steering reminiscent of a tank. A lever on each side of the operator’s chair controls the turns instead of a steering wheel. You can cut grass very close to trees and shrubs. Zero Turn models have engine sizes at 450 to 810cc and a quick top speed around 13mph. Their cutting decks range in size from 30 to 74 inches in width. The only downsides to a Zero Turn are that they are not stable on hills, and at their top speeds, don’t always do as good a job of cutting grass. Before we go any further, here are a few interesting facts about safety with riding mowers. Sensors under the seat of a riding mower cut off the engine if you stand up or fall off. You have to push on the brake to start the engine. Gas-powered mowers operate at about 85 to 90dB, so hearing protection is essential. Boots and gloves are also a good idea to wear when mowing the lawn. Mow up and down, not across a slope. Riding mowers historically caused the most serious injuries to children, with more than two-thirds of those hurt needing admission to the hospital. Please be safe, wear protective gear, and make sure the area is clear before you mow. We will review the best riding lawn mowers for the money. The following models are in order of cutting deck size. Power steering—Not an essential, just a convenience, because most of these models are easy to steer. Translucent fuel tank or a fuel gauge—It’s nice to see at a glance when you’re running low. High-back seat and cup holder—It’s more supportive and comfortable than a conventional seat, and having a drink handy is very nice in the summertime. Cruise control—Just like with a car, cruise control lets you set a ground speed with a riding mower. The Troy-Bilt 30-inch is a popular riding lawn mower. It’s perfect when you have a lawn that measures ½ to 1 acre in size and it handles uneven terrain well with its 420cc OHV engine with speeds up to 4.25mph. The OHV means that it’s efficient with fuel so the 1.3-gallon gas tank lasts you longer. The 30-inch cutting width covers the lawn much quicker than a push mower. The 18-inch turning radius helps you get in close to trees and flower beds, just not as close as you could with the Ariens Zoom 34 described below. This mower is pretty comfortable to use considering that it’s a less expensive rear-engine model. It has a soft-grip steering wheel and an adjustable seat. When you’re done working, the mower is small enough to store neatly in the garage or a shed. Troy-Bilt offers a 2-year warranty to protect your purchase against defects. We’ll begin with a small zero-turn lawn mower from Ariens, their Zoom 34 that has a Kohler 6000 Series engine. This mower makes it possible for home-owners with smaller lawns and less storage space to enjoy the convenience of a highly-maneuverable riding lawn mower. Its top speed is 6mph. It has a 34-inch cutting width, perfect for squeezing through gates and doorways. The 19Hp/660cc engine is powerful enough to make cutting up to 2 acres an easy job. Plus, you can adjust the cutting height from 1.5 to 4.5-inches, perfect for just about any kind of residential lawn grass. Besides cutting, you can add a few accessories to the 34-inch Zoom, like a 36-inch Poly Roller, a 48-inch Plug Aerator, a dethatcher, and a spreader. Ariens also sells a bagger and a mulcher that are compatible with this model. They offer a 3-year limited warranty. Troy-Bilt’s Mustang won approval from Consumer Reports as a “Best Buy” riding lawn mower. They called it the “ultimate in cutting performance.” Of course, with a 42-inch deck size and twin blades, it’s aimed at customers with at least one to two acres to cut as well as sufficient space to store it. Owners have commented that the Mustang “maneuvers effortlessly around obstacles.” The 24Hp V-Twin Briggs & Stratton engine moves it forward at speeds up to 7mph and in reverse up to 2.5mph while the Dual EZT Transmission is simple and smooth to use. The eight adjustable cutting heights are ideal for a wide range of grass types. The 360-degree maneuverability makes it possible to cut very close to obstacles so you only need an edge trimmer to finish the lawn. The 18-inch high back padded seat and dual-suspension springs makes the Mustang comfortable to drive for long periods of mowing. It comes with a rear bumper and deck wash port. You can also add other accessories like a bagger or mulch kit, tire chains, and a cart for hauling. Troy-Bilt offers a 3-year limited warranty for residential customers as well as a limited lifetime warranty on the Mustang’s frame. Yes, we’ll say it,“Nothing runs like a Deere.” No review of lawn tractors would be complete if there wasn’t a John Deere in it. The D155 48-inch mower with its 24Hp 2-cylinder Briggs & Stratton engine got a lot of positive feedback from Consumer Reports. The hydrostatic transmission works smoothly to change speeds and switch from forward to reverse. The three blades give a great cut and do a good job mulching. For a lawn tractor, it has an average-size turning radius of 18 inches. But it cuts in reverse, has cruise control and a high-back seat, and a washout port for easy cleanup. John Deere offers a 2-year, 120-hour bumper-to-bumper warranty. With the Husqvarna YTH24V48 Yard Tractor’s 48-inch mowing deck and three blades you can cut a large area up to three acres quickly. It handles uneven terrain like hills much more safely than a zero-turn mower can. It can mow, mulch, push a snowplow, and pull a variety of attachments like a cart, spreader, and de-thatcher. It turns on with the twist of a key thanks to its keyless start. Engage (or disengage) the blades with the pull of a lever. The YTH24V48 has a pedal-operated hydrostatic transmission. You’ll change speed and direction with your feet and still steer with your hands. You can also mow both forwards and backwards. If you just drove over yard-high grass on the back forty and you’re not happy with the way it looks, back over it to cut it again. Husqvarna included headlights in case you’re up early or out late working. The seat has spring suspension, moveable armrests, and is adjustable to various heights for the comfort of multiple users. The only downside we saw to this lawn tractor is the short warranty—Husqvarna offers just one year. Poulan Pro is part of Husqvarna’s umbrella of companies, but their 54-inch lawn tractor isn’t a copy of the Husqvarna model we just reviewed. Instead, the PB24VA54 has a 24Hp V-Twin Kohler engine and a wide 54-inch reinforced cutting deck. The deck and belt are covered by a 10-year warranty. Like the Husqvarna and many other lawn tractors, this one has a hydrostatic pedal control transmission. It sports a 2.5-gallon fuel tank so you can mow the whole lawn without having to refill. This is important because there is no fuel gauge. In case you’re up early or out late, the tractor has headlights. The 15-inch high seat back is suspended on springs for a smooth ride. The PB24VA54 has a rather tight (for a tractor) turning radius of just 16 inches. 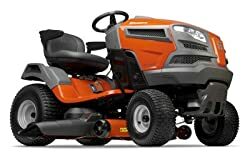 The other advantage to this model is that it’s typically priced lower than similar lawn tractors. We’ve arrived at our final model in this review. 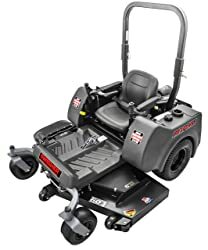 It’s the Swisher ZTR2760BS 60-inch Zero Turn Mower, made in the USA. It has a commercial-grade 27Hp Briggs & Stratton engine and three Gator mulching blades so you get a professional cut every time. It rockets up to 8mph both forward and in reverse, and it’s easy to switch gears with the Ogura clutch and Hydro Gear 2800 transmission. The engine isn’t the only commercial-grade part; it has a heavy-duty welded steel frame and 11-gauge cutting deck. Besides all these features, there are some finer touches. It has a front and rear hitch, a 12V adaptor, an hour meter so you can know when to perform routine maintenance. And yes, it has a cup holder, too. Swisher offers a 3-year limited warranty. Q: What kind of maintenance will I need to do with my new riding lawn mower? A: Gas-powered engines on need tune-ups each year. That means changing the oil, checking the battery, cleaning and replacing filters, checking the air in the tires, and replacing spark plugs. You’ll also need to sharpen the blade(s). There are many shops that will take care of this for you, or you can save money by doing it yourself. A: Gas motors on mowers, even on efficient engines, make enough noise that hearing protection is highly recommended. Lawn mowers can range between 80 to 100dB, and listening to that for over an hour will put your ears at risk of permanent damage. Even just a 20dB reduction in sound will keep you safe for the time it takes to mow. Q: What if my riding mower won’t start? A: Let’s go over the basic problems that might cause a mower to fail to start. One, does it have fuel and oil? Is the fuel fresh, less than a month old? Or at least treated with a preservative? Is the shut-off valve closed? Is there water in the gas tank? Is the fuel tank cap clogged or not vented? Is the spark plug good? Is is clean? Is the spark plug lead in good condition? Check these things first. If you can’t find the solution, you may need to check with a mechanic. Here are some items we recommend to make your mowing experience safer and more comfortable. Protect your hearing and still listen to your favorite programming while you mow. Plus, keep your eyes safe from flying debris. These soft earplugs mold to the shape of your ear and reduce noise by up to 32dB. These gloves are 8 times stronger than leather with a Level 7 cut resistance. Not only does this hat keep your head in the shade while you mow, it won’t blow away on windy days and it has a zipper pocket in the cape. When it’s time to store your riding mower, consider getting a sturdy dust cover to protect it. If this one pictured is too small, try this one here. We hope you enjoyed our reviews today and that they helped you choose the best riding mower for your lawn. Check back soon for more reviews of the best products on the market.